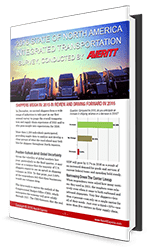 In December, we conducted a survey with shippers across the country, asking them about their opinions on industry trends and how they had been affected during 2015. We also asked about their top concerns for 2016. We had over 1,200 responses! The purpose of the survey was to identify the challenges and opportunities that shippers experienced in 2015 and to gauge their expectations of 2016. After analyzing the respondents' answers and feedback, we compiled the data into an informational piece that all shippers can benefit from! Are businesses expecting to ship more or less in 2016? Which transportation service are shippers most interested in learning more about? How have capacity issues in the truckload service sector impacted businesses? Did the West Coast port congestion and labor issue actually convince shippers to move cargo east? Download The Survey Results Whitepaper Now!